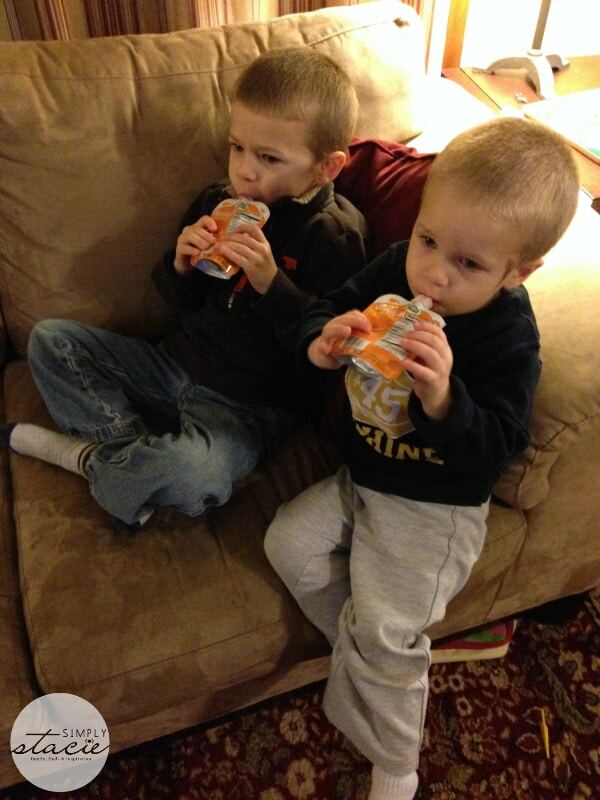 My boys, like me, are snackers. We tend to eat pretty healthy in our house, so most of our snacking involves fruit, veggies, granola bars, etc. When I’m out grocery shopping I’m always looking for different healthy treats for my boys, and they are always up for trying something new. So when the opportunity to try a new healthy snack from Baby Gourmet arose, I knew my boys would be more than willing to give it a try! 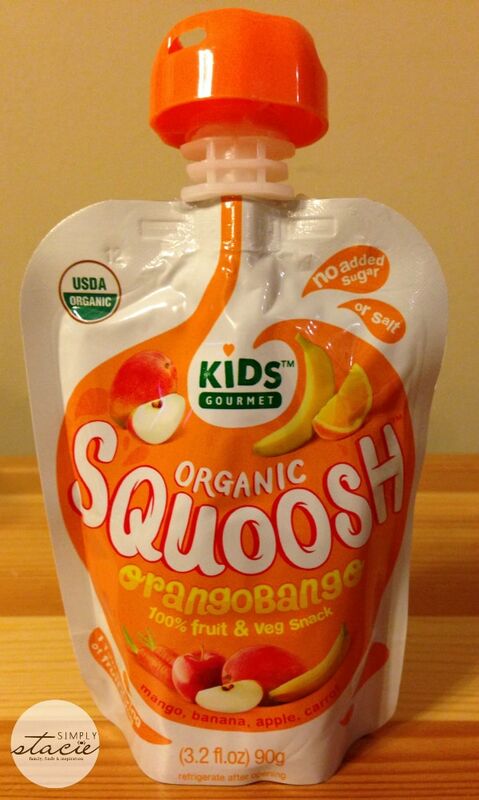 We received a case of Squoosh Orangobango snack pouches for review from Baby Gourmet. Even before the snacks arrived, I was impressed by what I had read about them. They are organic, GMO free, gluten free, with no added sugar or salt, the packages are BPA free, and every pouch is one full serving of fruits and veggies. Billed as a “school age snack”, these pouches are a great fit for lunchboxes. The Orangobango flavor combines mango, banana, and apple with carrot, for a very “summertime” flavor. Both of my boys went crazy for this flavor. My husband and I tried it as well, and we could definitely see the appeal for the boys. The fruity sweet flavor is quite tasty. These are snacks that I’m more than happy to give my children, and we’ll definitely be picking up the other flavors in the Squoosh line to try! An Orangobango carton of four pouches has an MSRP of $5.69. 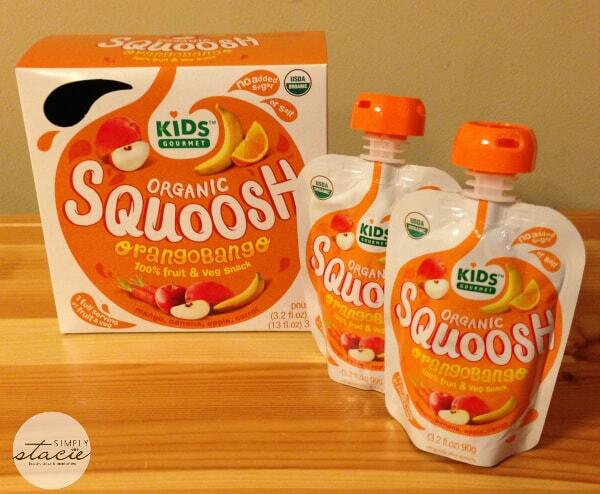 The other flavors of Squoosh that are currently available include Beetberry, Banango, and Squabbleberry. To find a store near you that carries Squoosh, check out their store locator. If you’re looking for a treat to give a young child in your life this holiday (think stocking stuffers! ), these Squoosh pouches are a great alternative to chocolates and candies. Baby Gourmet was founded by Jennifer Carlson – a mom who wanted to feed her babies food that was healthy and tasty, but was disappointed by the options she found at the grocery stores. So she started making her own baby food based on family recipes, and with the help of her sister, Jill Vos, Baby Gourmet was born. Jill makes sure all the Baby Gourmet recipes are filled with only the best, freshest, organic, kosher ingredients from around the world, while Jen oversees every aspect of Baby Gourmet with the passionate and watchful eye of a mother and a business professional. To see all of what Baby Gourmet has to offer, check out their website. My kids are aged 6 & 4 and have them in their lunches almost every day. They are great snacks before dance and gymnastics as well. Love them!! I like that they now offer wholegrain baby cereal! I love that their products contain more vitamins than other popular brands! I love having quick easy super healthy options for my little one to eat. But you know they are good when my 14 yr old devours them as well! They taste every batch themselves! I love that they have organic ingredients. No added sugar or salt – awesome! I like the organic ingredients and the whole grain cereals are good too. I learned that the founder of Baby Gourmet is Jennifer Carlson. I love how healthy they are .. all the vitamins!! No sugar or salt added. That makes Mom happy. I learned Jennifer Carlson was disappointed by the options for healthy baby food so she started making her own. I love how their is no sugar or salt added. I like the ones with greens in them, hard to get my kids to eat that. 4 flavors with no added sugar and salt. I liked that they are organic. How healthy they are and they taste each batch themselves! I like that is has no added sugar! Organic,whole grain and full of vitamins to keep my kids healthy! Every package of Baby Gourmet passes strict nutritional and food safety guidelines. We pass all USDA and organic certifications. But, as moms, we go a step further. We actually taste every single batch ourselves. If we don’t absolutely love it, we pour it out and start from scratch. It’s true! I like that they have options from baby to school age! These are available at the Meijer stores in my area! I like that there’s no added sugar or salt! I would like to have Mushies for my granddaughter. They all have regular ingredients and nothing horrible! I like that they use organic ingredients. The organic whole grain cereals! I like that there is no salt or sugar added.